Calvin Klein Dress - clean lines, simple - love the cut. It's like a blank canvas. 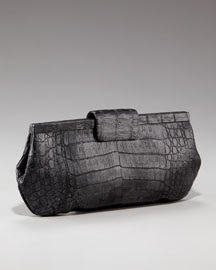 This purse is by Nancy Gonzalez - "Tab-Top Crocodile Clutch" from Neiman Marcus. There is a matching purse to the shoes but once again, I chose this so it wouldn't be so "matchy-match". This purse would have a long shelf life because it's classic black and has a great shape - a good investment piece. 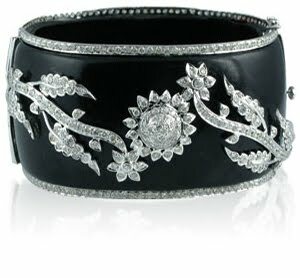 Love this bangle bracelet by LMS Gems. Rarely will you see me when I don't have on a chunky bracelet. Add some diamond sparkle to that and I'm a happy girl. Inside, I am forever 6. OOOOOHHHH....shiny! 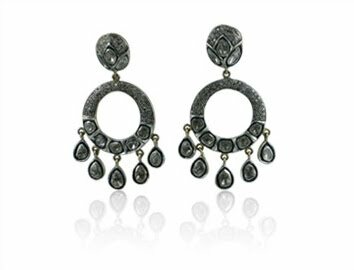 I was afraid black shoes would be too heavy for spring and the shiny shoes will coordinate with the jewelry without being too over the top. I hope you enjoy shoes like I do because it's one of my weaknesses and you will see them often! These are Jimmy Choo from Neiman Marcus. Now that we have gotten through the outfit, can we talk about that model? Somebody get her a Krispy Kreme doughnut PLEASE! Look how hungry and angry she is! I'm guessing she is cold too because ultra skinny girls are always cold. I like to think of it as the curvy girl's revenge! Seriously - have a Coke and a smile.